Q. My 5-year-old gelding holds a quiet, steady rhythm to his jumps, but he tends to land on his forehand and gets strung out after the fences. What can I do about this? Set up a small vertical in the center of your arena, parallel to the wall, so you jump toward a visual aid that encourages your horse to pay attention after the jump. Canter the jump toward the wall and halt quietly after the fence. Don’t be rough about this. Instead, sit up upon landing, close your fingers and legs, and ask him to halt, calmly, before you get to the wall. You may need to practice this a few times before your horse gets the idea. 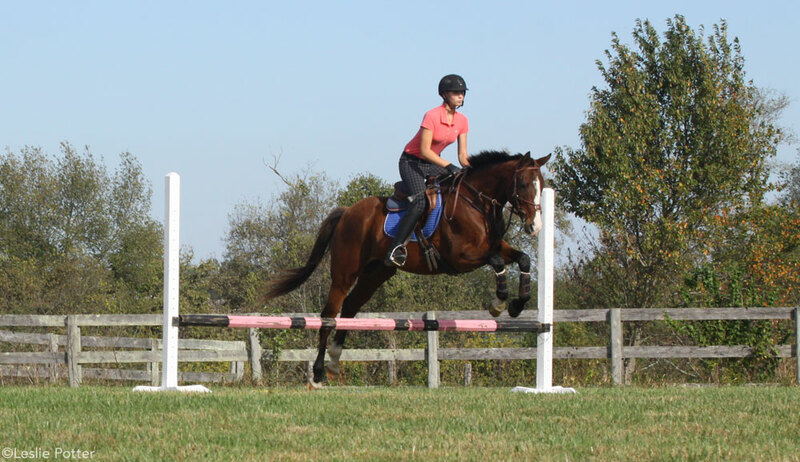 Canter your small vertical toward the wall again, but this time, instead of halting, ride a transition to sitting trot on a straight line before you get to the wall. Then ride a small, 10-meter circle in sitting trot in either direction. (Alternate which way you turn.) 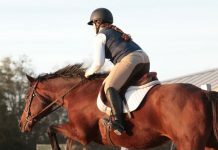 Sit up, half-halt, and close your legs after the fence, just as you did for the halt, but now add leg and ask your horse to stay active behind as you urge him forward into an organized sitting trot. Ask your horse to stay light in your hands as you half-halt; you may need to actually lift your hands to pick his head up for the transition so that he’ll stay light and balanced. The small circle will keep him engaged, and the change of direction will keep him listening to you. These exercises should help your horse within one or two practice sessions. Once he gets the idea, you can go back to riding away from the jumps. But add these exercises into your warm-up routine, or return to them whenever your horse gets strong or unbalanced after a fence. 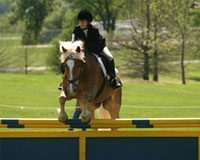 Hunter/jumper equitation trainer Greg Prince has coached many riders through regional and national equitation finals from Woodridge Farm in Sherborn, Mass. i have a 6 year old appy mare that is trained western pleasure and im training her to jump it has been going fine and we have gone from ground poles to 2ft6in but my horse refuses to do bounces runs out, stops or just runs through them i fell off her for the first time in 2 years!! i am a young rider but i have been riding my whole life and dont know if it is me or she doesnt like to jump she has never refused befor that day and now she is refusing all the time! i dont know what to do can anyone help me? I have alwase set up a large X-rail to center the horse in the jump and a pole on both the take off side and the landing side | 6′ X 6′ | for a trot and | 10′ X 10′ | for a canter. Now you have to be sure to sit up after the jump otherwise you are causing the way the horse is landing. You fall on him = he lands in a heap. try sitting up in a 3-point over the smaller fences 3′ and smaller.